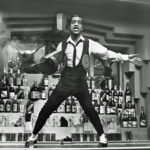 One of Sammy Davis, Jr.’s enduring legacies will be as a member of the iconic ‘Rat Pack’, the name given to Frank Sinatra’s close circle of friends at the beginning of the 1960s – an ensemble which included Dean Martin, Peter Lawford, Joey Bishop, and associates Marilyn Monroe, Angie Dickinson, Shirley MacLaine, Buddy Greco, and Henry Silva. In enduring popular culture, though, the ‘Rat Pack’ has come to centre around Sinatra, Martin and Davis. The origin of the ‘Rat Pack’ term dates back to the early 1950s and Humphrey Bogart, whose cabal of friends were known as the ‘Holmby Hills Rat Pack’. Members included Bogart’s wife Lauren Bacall, Judy Garland, Sid Luft, David Niven, Mike Romanoff, Katherine Hepburn, Spencer Tracy, Jimmy van Heusen, with Frank Sinatra as ‘pack master’. 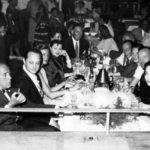 Sammy was on the periphery of this social group, having been taken under Bogart’s wing somewhat after Bogart saw him perform at Slapsie Maxie’s in 1946. Sinatra’s centrality to both groups probably explains how the name transferred from one group to the other in popular culture, although Sinatra, Davis and Martin never referred to themselves using the name (they occasionally used the term ‘the Clan’, before dropping it due to its negative connotations). A paperback ‘expose’ released in 1961 by Richard Gehman called Sinatra and his Rat Pack doubtless contributed to the popularisation of the nickname. Sammy first met Sinatra in 1941, when The Will Mastin Trio opened for Tommy Dorsey and His Orchestra in Detroit. Sinatra, then 26, was the lead singer, and he and Sammy, aged 15, hit it off. The two reconnected in 1945 when Sammy showed up at the stage door of Frank’s CBS radio show in Los Angeles. Two years later, Sinatra personally requested The Will Mastin Trio open for him (instead of the Nicholas Brothers) for three weeks at the Capitol Theatre in New York in 1947. Sinatra and Davis cemented their friendship during this period – and while Davis’s role in the Trio’s generic act at the time featured him doing singing impressions of other singers, Sinatra encouraged him to sing in his own voice. The two kept in touch. In March 1950, Sammy went to see Frank at the Copacabana in New York with Buddy Rich. They were turned away at the door on account of Davis’s skin colour. Sinatra heard about the incident and insisted Sammy return the following night, alone, to be let in. To say Sammy idolised Frank would be an understatement. 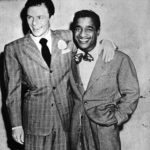 While Sinatra assisted his protégé wherever possible, there is a myth that Sinatra used his clout to enable Sammy to break the color bar in Las Vegas. 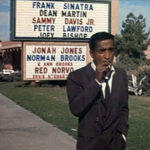 The truth is that by 1954 Sammy had become a big enough star to break the colour barrier in Las Vegas of his own accord. Frank and Dean Martin had known each other for years, but it was while filming Some Came Running in 1958 that the two became close. 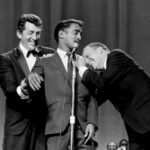 Sammy knew Dean, partly through Sinatra and partly through his close friendship with Martin’s comedy partner Jerry Lewis. Peter Lawford had appeared with Sinatra in It Happened in Brooklyn in 1947, but the two only become friendly in 1958 through mutual friends Natalie Wood and Robert Wagner, and thanks to Lawford’s connection as John F. Kennedy’s brother in law. In 1960, Sinatra, Martin, Davis, Lawford and Bishop starred in the movie Ocean’s 11, which started filming in Las Vegas on 26 January. During filming, the group performed a nightclub act concurrently at the Sands Hotel each evening, in an extravaganza they referred to as ‘The Summit’ (a reference to the East-West Paris summit planned for May 1960 between the US, USSR, UK and France, which had been announced at the end of 1959). Soon, hotels on the strip were booked out, and people flew in from all over the country to watch the show, including John F. Kennedy himself, who stayed at The Sands on a campaign visit (and was introduced by Sinatra to Judith Campbell, with whom he began an 18-month affair). ‘The Summit’ at The Sands occupies a special place in entertainment folklore. Shooting Ocean’s 11 was an elaborate excuse to pal around together, “find fun with the broads”, and generally carouse the nights away. The movie featured a gang of World War II veterans who are recruited by Danny Ocean (Sinatra) to rob five different Las Vegas casinos (Sahara, Riviera, Desert Inn, Sands, and Flamingo) on a single night. Sammy played Josh Howard, a sanitation worker, and was given one of the two musical numbers in the film, “Eee-O Eleven”. 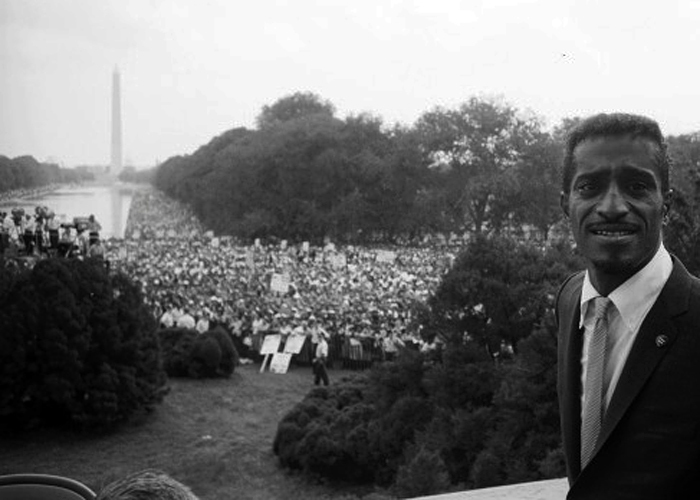 The movie was a commercial success and was the 8th highest grossing film of 1960. The five met up again in June 1961 in Utah to shoot Sergeants 3, which was Gunga Din remade as a tongue-in-cheek Western, with Davis playing the equivalent role of Gunga Din, an ex-slave Jonah Williams. The movie did little at the box office. In 1962, Sinatra and Martin made 4 for Texas, while Sammy took a small role in Johnny Cool, produced by Peter Lawford, and with Joey Bishop also in the cast. Sammy also sang the title theme, which was written by ‘Rat Pack’ associates Sammy Cahn and Jimmy van Heusen. 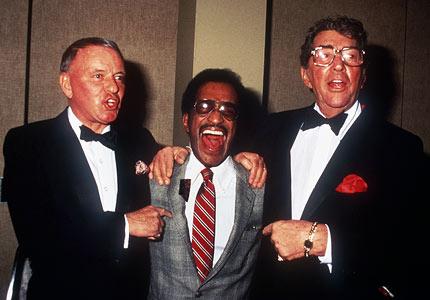 While various members of the circle would occasionally team up for movies, it was Sinatra, Martin and Davis’s regular performances on stage together through the early 1960s that would cement these three in showbiz consciousness. In August 1962, the three had performed at the 500 Club in Atlantic City as a favour for racketeer Paul ‘Skinny’ D’Amato, and in November 1962, the three performed at the Villa Venice in Chicago as thank you to mobster Sam Giancana for his assistance on behalf of Kennedy during the Presidential election. Both engagements piqued the interest of the FBI regarding the contractual arrangements of Sinatra, Martin and Davis. Recordings exist of shows at both engagements. All three were back at The Sands for another ‘Summit’ in January 1963, and returned again in September for another two weeks. That year, Sinatra had been forced to sell his percentage of ownership of the Sands due to his relationship with the mob, so it was somewhat ironic that the group’s last major activity at the time would be a spoof of organised crime: Robin and the 7 Hoods which took the legend of Robin Hood and re-worked it for prohibition-era Chicago. Filmed on location in November 1963, this would be a musical (unlike the previous two films). Alongside Sinatra, Martin and Davis, it featured Peter Falk, Barbara Rush, Victor Buono and Edward G. Robinson. Most notably, following a falling out with Sinatra, the role intended for Peter Lawford was given to Bing Crosby. Aside from a charity concert at the Kiel Auditorium in St. Louis in 1965 in which Sinatra, Martin and Davis all performed – backed by Count Basie’s band and MC’d by Johnny Carson – ‘Rat Pack’ activities had largely ceased by the mid-60s, with Sammy returning to Broadway in Golden Boy and Dean starting his Matt Helm series of movies. While all three continued to work together on various projects (Sammy appeared on The Dean Martin Show in 1970 and was the subject of a Dean Martin Celebrity Roast in 1975), Davis endured periods where he was out of Frank’s good graces (largely due to Sammy’s drug problems in the mid-1970s) and it wasn’t until May 1978 that the three were seen on stage together again, headlining the SHARE Boomtown Party in Santa Monica. In 1979, Sammy appeared on Sinatra: The First 40 Years, and in May 1980 was back filming a big-budget mention picture with Dean – Cannonball Run. Burt Reynolds was the star, and Dean and Sammy were paired as Las Vegas crooks disguised as priests. The movie was a big hit, the 6th highest grossing film of the year. Three years later they filmed the sequel, Cannonball Run II, in which Frank joined in with a cameo, and Shirley MacLaine and Henry Silva also appeared. 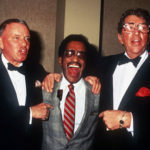 Sinatra, Martin and Davis would occasionally team up as a pair or group to perform benefits or at casino openings and the like throughout the 1980s. The ‘Together Again’ Tour kicked off at the Oakland Coliseum on 13 March 1988. Dean struggled with the lyrics and staging and, moreover, his heart just wasn’t in the late-night hell-raising that Sinatra had in mind. He lasted 5 shows before flying home, and checking into hospital claiming a kidney ailment. Sammy and Frank completed 11 further shows as a twosome before suspending the Tour. Liza Minelli was chosen to replace Dean, the Tour was rebranded ‘The Ultimate Event’ and kicked off again in September, finishing its US leg in Miami in January and then heading to Japan, Australia and Europe before finally concluding in May 1989. The final time Frank Sinatra, Dean Martin and Sammy Davis, Jr. were together on stage was 13 November 1989. 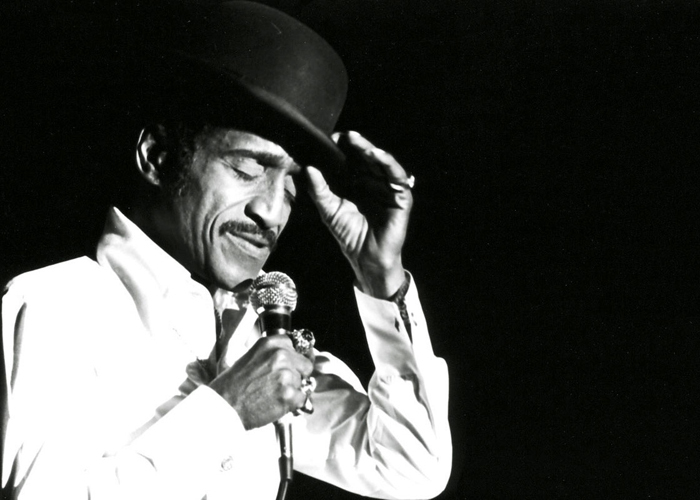 It was a tribute to Sammy, a star-studded gala called the Sammy Davis, Jr. 60th Anniversary Celebration. It would be a farewell, given Sammy’s ailing health at the time – he died three months after the special aired. The show subsequently won an Emmy for Outstanding Variety, Music or Comedy Special.